These high school students get a 15-minute recess every day––and teachers praise the benefits. MHS Unplugged is a 15-minute recess period every day for all Montpelier High School students. Recess includes activities that are student- or teacher-led, like yoga, meditation, Frisbee, basketball, jam band, and art projects. Students unplug from the curriculum, from stress, and from electronics during these 15 minutes. The short break provides them an opportunity to connect with one another and teachers in a new way, and as a result, students feel more productive and more connected to the school community. MHS Unplugged is coordinated by one of the faculty members, Bill Laidlaw, who is a special educator at the school. When MHS reorganized their schedule into 85-minute blocks, they found that they had an extra 15 minutes every day, and wondered what to do with this small block of time. MHS Unplugged was created. Recess is scheduled between the third and fourth blocks, at around 1:15 PM. Students or teachers can suggest and lead activities. When a student suggests and wants to lead an activity, Bill makes sure there will be faculty supervision and involvement. He also makes sure there is a room for the activity, so if a student wants to do theater improvisation, he investigates whether the auditorium is available during that time. If a teacher wants to lead basketball, the gym should be available. Activities can also vary depending on the weather. 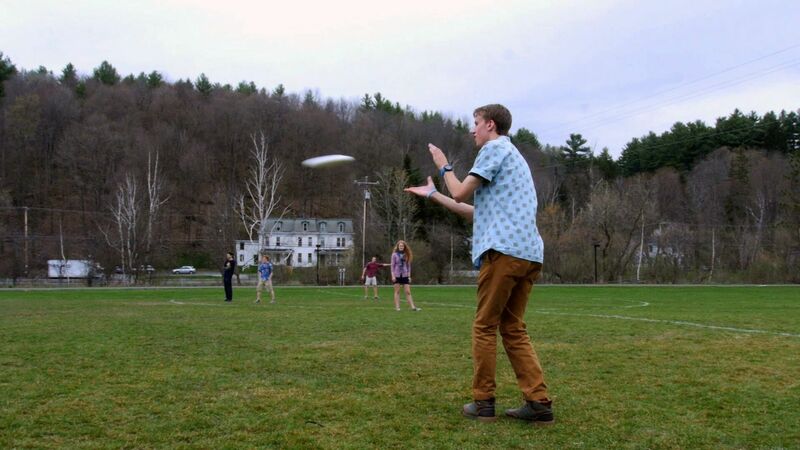 When it's nice out, students like to be outdoors for Frisbee, or a 15-minute workout, or a walk around the school grounds. There is a central board in the main hallway of the school where all MHS Unplugged activities are listed along with the rooms where they take place. Students just check the board that day and go to one of the activities. They're free to choose something different each day. Typically, activities last about four weeks, and then new ones are placed on the board. Some activities might be repeated if there's enough interest. "Walk + talk" (taking a walk on the school grounds). True to the program's name, activities do not include anything computer- or electronics-based. "Unplugged" really does mean unplugged. Bill sometimes finds that he needs to encourage students and teachers to suggest and lead activities. The whole thing won't work without participation from all involved. Occasionally there are slow periods when only a few activities are offered, and Bill pushes for more suggestions. There are also times when students want to use those 15 minutes to make phone calls or study for a test in the library. However, the school really does encourage students to use this time for unwinding. As Bill says, "You have permission and you need to stop what you're doing, and do something totally different, totally challenging. Something that's mindful, something that creates community, something that creates generosity." One of the best outcomes of implementing MHS Unplugged has been the community that it's built among the teachers and students. Relationships are fostered because those who normally don't see one another all day now have an opportunity to do something together. Sometimes, teachers and students are also able to build a relationship outside of class, which helps to strengthen what happens in class. There's a connection made when teachers and students get to know one another better, and there's a sense of caring and community in the school. Students and teachers also report coming back for the rest of the day more energized. Those 15 minutes serve as a break that reinvigorates all involved. Demographic data is from the 2012-13 academic year. Fiscal data is from the 2014-15 academic year.